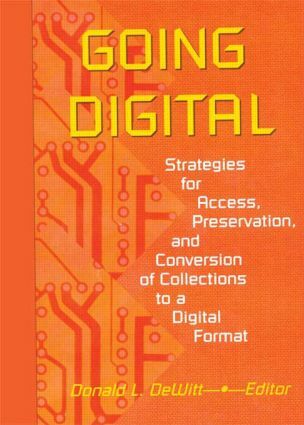 Going Digital: Strategies for Access, Preservation, and Conversion of Collections to a Digital Format offers you succinct and analytic views of the problems and benefits of digital resources in the traditional academic library. Library administrators, collection managers, and librarians will learn the advantages and disadvantages of traditional and digital collections and the costs of providing local access or implementing remote access to digital collections. Originally presented at a series of five symposiums sponsored by the Research Libraries Group, the articles inGoing Digital will help you decide upon a cost-effective collection method that will meet the needs of your library, your patrons, and your budget. In light of the changing ways we receive and keep our information, Going Digital discusses new collection preservation criteria and suggests that access and informational values, not just deterioration, should be equal factors in selecting materials to be converted to digital form. Proving that digital collections are changing every facet of library operations, Going Digital shows you the most cost-effective way to begin a digital collection and how to choose what materials to digitize in order to provide your patrons with the information they want and need. What Will Collection Development Do?